A Gaelic singer from Skye and an East London-born beatboxer have co-created a new musical collaboration. Anne Martin and Manchester-based Jason Singh drew on their different cultural heritages for Roots. Roots emerged from the musicians'' project, Ceumannan. 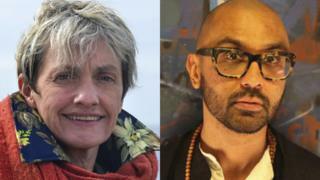 Singh and Martin were first introduced by Skye arts organisation, Atlas Arts, in 2013 when Singh was invited to take part in a project called Spincycle - Skye. The musicians went on to perform together at Martin's home. She said: "He asked me to sing a Gaelic song and, when I did, he began adding these amazing vocal effects. "It was nothing like what I expected from a beatboxer but his sound was surprisingly complementary to my music. "It was from here we started on this journey that we are still taking. It is not just about the music and beats, but about the story of the songs." Over the following six months, the singer and beatboxer swapped information on their respective history and culture - Martin's from growing up on Skye's Trotternish Peninsula and Singh's from his family in Pakistan. Singh's other work in Scotland has included giving performances during screenings of silent film made 87 years ago about Scottish herring fishermen. Drifters was made in 1929 by acclaimed Scottish documentary-maker John Grierson. It shows fishermen harvesting shoals of herring off Scotland's east coast. Singh providid vocal sound effects during screenings of the film in Lerwick, Helmsdale and Anstruther.